I was at my local DavidsTea and I asked my friendly neighbourhood tea pusher what the new tea was and he told me that it was Tea the North. Now, I know DavidsTea already has a maple syrup tea called Oh Canada! so I wasn’t really expecting something similar, but still was expected something with some maple influences, or something else that screamed ‘Canada’ to me. What I smelled instead was a lot of coconut and pineapple. Instant recoil from the container holding the sample that I was just smelling because it just did not make sense. 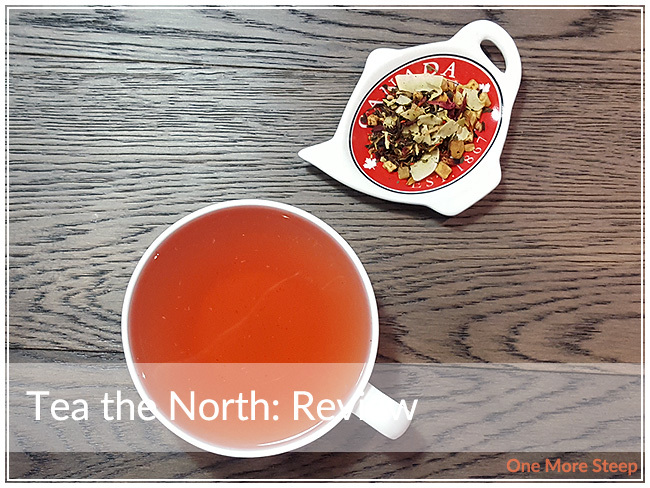 Tea the North consists of: melon, pineapple, coconut, white tea, hibiscus, sweet blackberry leaves, apple, rose petals, rhubarb, safflower blossoms, and natural flavouring. He had rattled off the list of ingredients to me and I must have looked confused because then he told me that most of the ingredients were white or red. Oh. I suppose that makes sense? But coconut and pineapple does not scream Canada to me – it makes me think of pina coladas (and getting caught in the rain). Nevertheless, I wanted to try a bit of this white tea blend because I’m a bleeding heart (and Canada Day is one of my upmost favourite holidays). DavidsTea recommends steeping Tea the North in hot water for 4 to 7 minutes. For those interested, “hot water” is defined on the product page as being 167-176°F or 75-80°C. I did an initial steep of 5 minutes in 175°F water. 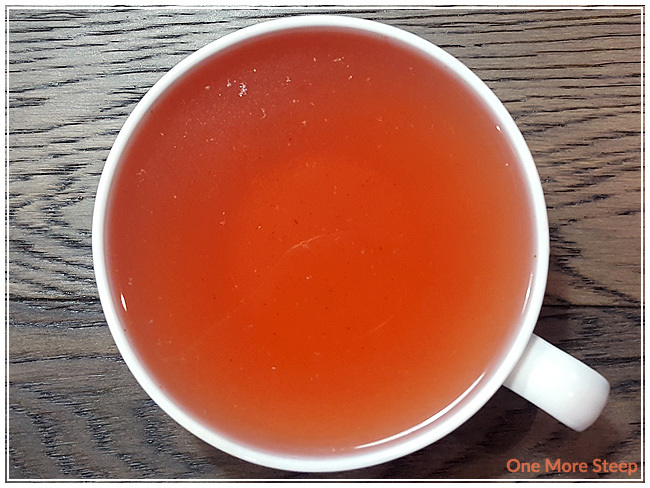 Tea the North steeps to a bright red – which did not surprise me given the fact that the blend includes hibiscus, rhubarb, and safflower blossoms. The taste of this tea is… interesting? There’s sweetness to it that comes from the fruit (melon, pineapple, apple), and a touch of tartness (from the hibiscus and possibly the rhubarb). I think I would describe this as being primarily coconut and artificial flavouring. The coconut flavour is heavy in this white tea blend, and there’s just something about it that lingers on my tongue that I just do not like. 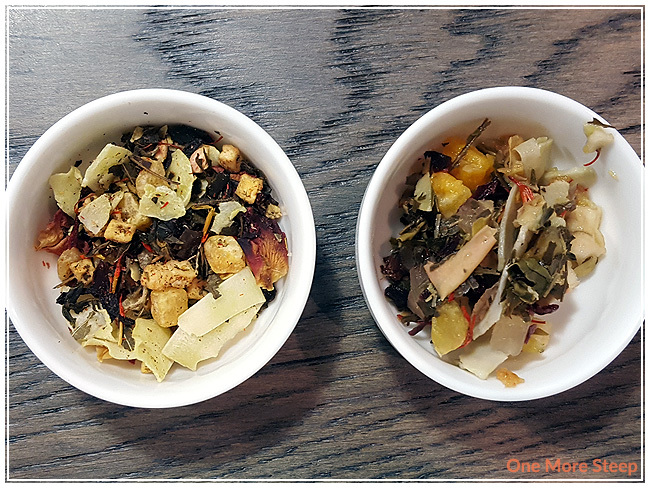 I’m not sure if it is the flavouring in this tea, or maybe just the combination of flavours, but coconut takes center stage and all the other ingredients (aside from adding a touch of sweetness or tartness) stay in the background – the far, far background. I didn’t really want to, but I did resteep Tea the North. The second time around was not an improvement on the first, I’m afraid. Is it possible for coconut to strengthen in flavour? Because that’s what it seemed to do here. The mix of sweet and tart was incredibly muted this time around, and I felt like it was just coconut again, with an odd aftertaste that seemed sour to me. 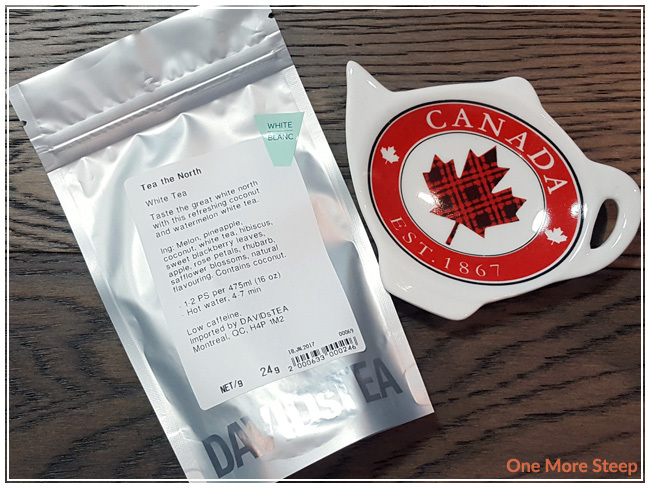 I didn’t like DavidsTea’s Tea the North. 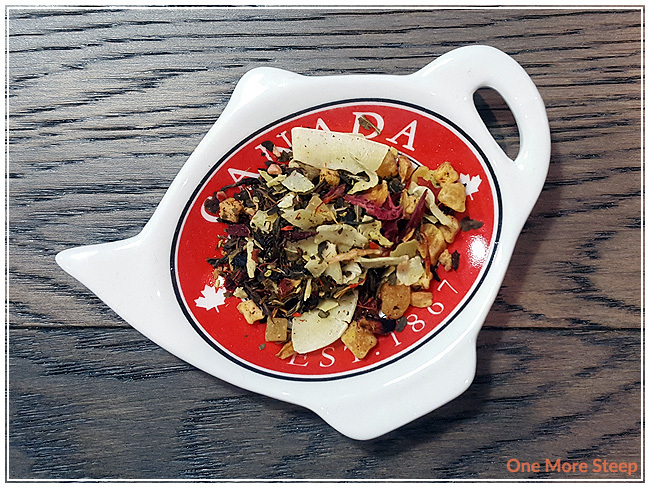 I wanted to at least love this tea blend, because I’m a sucker for all things Canada and with the impending 150th birthday (tomorrow/July 1st), I really wanted to love this tea. I think it’s cute that they did a blend of primarily red and white ingredients instead of doing maple (again), but I feel like it really missed its mark. The aroma of coconut and pineapple don’t make me think of Canada at all, and the tea itself was a bit of fail in the flavor department.